FIFA World Cup Qualifying: Is it really a "World" Cup? 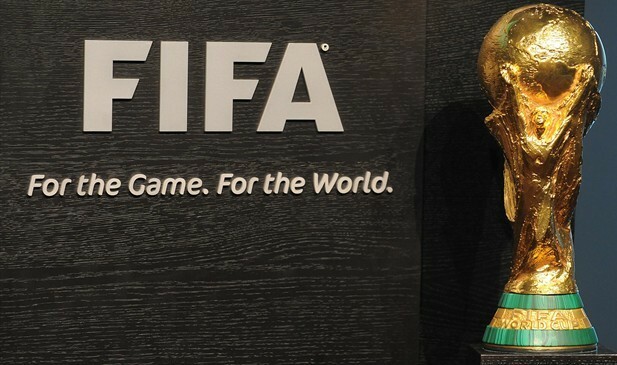 Injustice in FIFA World Cup Qualifying: Is it really a “World” Cup? KingFut’s Karim Salama analyzes the “injustice” in World Cup qualifying and examines a possible solution to make it more of a “World” Cup. There is an argument to say that the qualification process for the FIFA World Cup is not fair for all nations involved and in fact indicates a strong bias towards both the European and American continents. Even though there is exactly the same number of countries qualifying, CAF has less than half the places allocated as UEFA. This makes no sense. While Africa has to go through 3 rounds of qualifying, with only the winners in the final round progressing, Europe gets to have a play-off between 8 of the nine second placed countries in the qualifying groups. Why? What is the reason that these countries get a last gasp chance to qualify for what can only be deemed as fluff places designed to make up the numbers. The point of the World Cup is for each continent to put on display the BEST they have to offer. This is true in the case of Europe and then some. The top seeds in Europe are typically the traditional “big boys of football” with each being considered favourites almost every time. France, Italy, Germany, England, Spain, Netherlands, are countries that can be said to be the best UEFA has to offer, with few exceptions. Rarely are there ever any shocks regarding European qualification for the World Cup. (Between Spain, Germany, England and Netherlands, there was only one loss in qualifying for 2010). In Africa however, one or more of the continents “best” possible representatives misses out simply due to the lack of space. In 2010, Egypt, who had won the African Cup of Nations 3 times in a row (record), 7 in total (record), and were ranked 12th in the world missed out in a play-off to Algeria. Senegal, who once reached the quarter-finals missed out, as well as traditional powers Tunisia (4 appearances) and Morocco (4 appearances). African football can never have all its best representatives (Egypt, Cameroon, Nigeria, Ivory Coast, Morocco, Algeria, Tunisia, Ghana, and Senegal) present – all teams that you can say have just as much chance as the others of doing well in a World Cup. By contrast, Europe seems to enjoy allowing its “second tier” countries the chance of participating alongside its best. Half the countries in South America can qualify for the World Cup. While with all due respect to many Central American and Caribbean countries, the North American qualification process basically becomes a competition for third and fourth place behind the USA and Mexico. While both are exceptional teams, their qualifying process is ridiculously simple, and skews the perception of their constant qualification for World Cups. The OFC only gets a place dependent on a play-off. Perhaps it would be better for these 10 countries to join the AFC in the qualification process. This would create a zone of 53 teams, the same as UEFA and CAF, and as such should also be given 8 places to qualify instead of the combined 5. 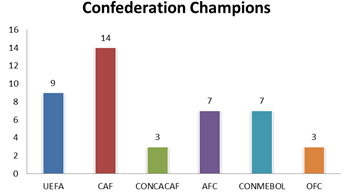 Let’s just look at a few more numbers to argue that representation of World Cup places fails to reflect the competition within each confederation. Only nine countries have won the European Championships, three of them being multiple winners, representing 17% of the member associations. Compare that with 14 countries who have won the African Cup of Nations that represent 26% of the confederation. Now when it comes to places given to each continental group for the World Cup, the numbers just jump in opposite directions. UEFA is allocated 41% of World Cup places and thus are ensured that 1 in 4 European nations will make it. Africa’s numbers correspond to 16% of entries to the show piece event, allowing approximately 1 in 10 countries the chance of attending. The story is similar for the AFC (Asia) and CONCACAF (North America), each seeing about 10% of their member nations a chance for places to the World Cup. 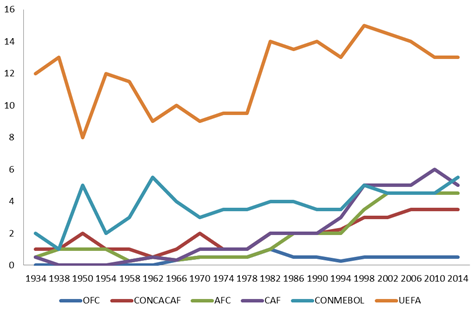 The extremes though go to CONMEBOL (South America) with 55% and OFC (Oceania) with 5%. The way these numbers work, when the groups for the World Cup are drawn, five of the eight groups will contain two European countries. It seems this “World” Cup is more a continued showing of European colonialism. Some would argue that Europe deserves its allocation based on the performance of European nations in previous World Cups. These people tend to forget that for the most part of the 20th century, many African countries were not independent nations. CAF was founded in 1957 with only four nations. And the first 8 World Cups only saw one instance of African participation (Egypt, 1938). So if Europe started with such an advantage, how can football in other confederations, especially those less developed, expect to improve if they are locked out from the exposure of a World Cup? Let’s not forget the financial reward brought on by being part of a World Cup. In 2010 each country was given $1 million just for participating, and those leaving the tournament after the group stage would take home an extra $8 million. For some of those “second seed” European nations that’s hardly going to have an impact on their accounts, yet to many other nations around the world that sum is a true game changer. So what can be done then to try and correct the injustice brought about by World Cup placing? In its current format the FIFA World Cup sees 32 teams divided into 8 groups of 4. The ideal scenario then would be to have 4 qualifying zones with equal representation, thus ensuring there would be no double-ups in any single group. However currently there are 6 confederations in world football. UEFA and CAF each have a near identical number of member associations, 54 and 53 respectively. If we combine the AFC and OFC just for World Cup Qualification this union would also create a qualifying group of 53 nations. It would also not be unprecedented as between 1966 and 1982 Oceania would join the Asian zone for qualifying. 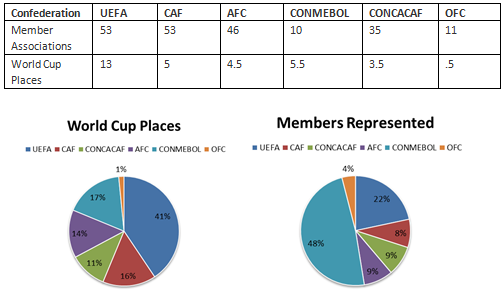 Next would be to combine CONCACAF and CONMEBOL for a grouping of 45 countries. These four qualifying zones would each be allocated 8 places. Levels of competition would increase as with the exception of Europe, every confederation increases the opportunities for their member nations to participate in the “World” Cup. I’d really like to see more African teams in the World Cup but it won’t happen until the teams at the big show actually perform. Asia does not deserve more than their allotted 4.5 spots and neither does Oceania. At 3.5 the amount of spots for North America seems about right. The goal is to get the best quality teams while retaining a ‘global’ feel. 13 places for UEFA is a bit much I wouldn’t mind if they lost two places and CAF gained them but there needs to be an argument for giving those slots to African teams. Of the European teams I think Italy, Netherlands, Germany, Spain, Bosnia, and Belgium have proven during qualifying that they belong in Brazil (and all will qualify directly to boot). Then you have 4 teams who have been good but have had their hiccups along the way but could be really formidable teams in Brazil: Croatia, Portugal, Russia, France fall into this group. Then you have a whole bunch of teams who have been solid but not spectacular chasing the remaining three positions. England (everyone wants to see them there but they have been HORRIBLE to watch)/Montenegro/Ukraine, Switzerland, Sweden/Austria, Bulgaria/Denmark/Czech R, Slovenia/Albania/Iceland. I wouldn’t mourn the absence of any of those teams- but let’s face it, if a team like Montenegro qualifies that isn’t a byproduct of European colonialism. I think the best thing to do here would be to introduce more playoffs. Have the top 9 in Europe qualify directly and then have the 6 best runners up play against runners up from Africa. It would logistically complicated, though. I think right now the best thing to do would be to eat in to Europe’s allotment. Best case scenario is that Europe gets docked a place and Africa gains one. FIFA could do this if 2 African teams make it out of the group stage in Brazil (something that has never happened before). we need alot more continental play-offs in the qualifation process to ensure that the best from around the world qualify.There shouldn’t be 13 places for Europe.In 2010,we saw countries like Slovenia and Slovakia (with all respect to both) qualify while 7-time and holders at the time of the African Cup Of Nations didn’t(who also held the cup 3 times in a row).How many times did the above countries reach the Quarter-Finals of their respective continental competitions? why should the other 6 runner ups playoff against the teams from africa? why do they deserve the extra places in the first place? you cant expect teams and regions to improve the quality of football(infrastructure, coaching etc) if the chance of them qualifying is so slim that they can never go to the party anyway… the only continent in the solution i gave abvoe that would lose anything is europe, all others either maintain or increase their allotment. why should a country thats not even the best in its group be considered for a place in the world cup? Forget about number of countries. Population is a much more fair way to distribute so that every person in the world is equally represented. Since 60% of the population in the world lives in Asia, they should get 60% of the spots in the World Cup. Sound ridiculous? Of course it is. This isn’t purely about equality. It’s about finding the right balance between having the best teams in the tournament while also giving the weaker continents a crack at it. The European and South American teams tend to be the best in the world. If the World Cup were selected purely on quality, an even higher percentage of spots would be taken by these 2 continents. But in an attempt to make the World Cup more global, those continents (especially Europe) have sacrificed some spots to give the continents with weaker football teams more spots. But not so many spots that it dilutes the quality of competition greatly or eliminates European or South American countries that had much of a shot of progressing far into the tourney. This is about as fair as you can get. An analogous situation can be found in the NCAA college basketball tournament. Each conference gets one automatic bid, while the rest of the spots are allocated by a committe, and go almost exclusively to the most powerful conferences. This lets the little conferences who have no shot of winning the tournament still get a bid while reserving most of the spots in the tournament for the legitimate contenders. The system is well designed. After seeing the Giants of African football cut out from Russia I knew the odds were against Africa. Thanks for proving that clearly.Any wsy when has anything European controlled been fair to Africans. Demand more spots or boycott,watch how quickly they will find more spots. The 2026 model gave Africa more spots but also increased European spots, noohing changed. Come Russian 2018 I’m from Nigeria, Senegal,Morocco,Tunisia and Egypt. No borders in Africa when it’s world cup. Please learn to use however correctly. When you use it as an intensifier, you need commas around it. You’re supposed to be a journalist; you’re supposed to have a grasp of the rules of grammar and syntax.